Sam Gosling is an associate professor in the Department of Psychology at Univeristy of Texas at Austin. 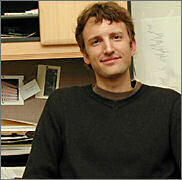 He is a nationally regarded researcher and innovator in the field of personality and social psychology. He investigates how personality is expressed in everyday places such as living spaces, offices and virtual environments. He is the author of Snoop: What Your Stuff Says about You.